Hey here’s the score update for the middle of week 5. 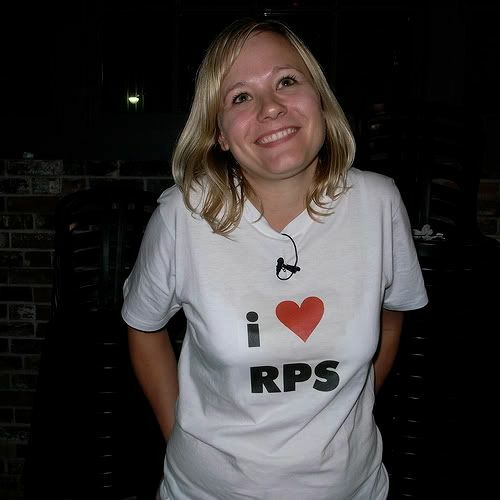 There is no RPS on this coming Monday (Memorial Day) at the Raven Lounge! And would you look at the calendar – looks like after tonight there’s only 8 tournaments left until the City League Championship.Â There’s still time,Â but if you hope to qualify and aren’t looking so hot right now then you better get out and play. Total points is really tight at the top – Loomer is still in 1st with 50, but Billy Shears has moved up into 2nd with 43 and Frankie13 is right behind him with 41. The Rookie of the Year is also shaping up to be a 3 person race at this point.Â Dr. Hambone is tops there with 31, his teammate B-Pac has 27, and dOGulas is in 3rd with 21. The Street lead briefly switched hands this week, but Frankie13 is back in the lead there as of now with a total of 257.Â Grim Trigger is in 2nd with 229.Â There’s several people not so far behind considering there’s usually about $200 on the floor at any given event. The Majestic 12 has a firm lead on the team prize with a total of 137 (Loomer and Billy Shears have 93 by themselves).Â David Bowie’s Package is in 2nd with 79 and the Dirty Dozen is in 3rd with 52.